Ready to earn rewards just for getting a good night's sleep at Drury Hotels? When you join Drury Rewards, you'll earn points toward future Drury stays, retail and restaurant gift cards, airline miles and more. With these perks and more, you'll rest easy. Have a Drury Rewards card? Click here to complete your enrollment. Yes, I want to receive promotional emails from Drury Hotels. You won’t have to wait to start seeing the perks. As a member, you’ll get rewarded just for signing up! Drury Rewards members have access to an exclusive rate when rooms are booked online at DruryHotels.com. Travel costs can add up, but with Drury Rewards, they don’t have to. Redeem your points for a free room or suite at any Drury brand hotel or Pear Tree Inn. So, stay awhile. This one’s on us. Feel like paying it forward? Give some comfort to those in need. Use your points to help the American Red Cross Disaster Relief Fund provide aid to disaster victims. Charitable contributions start at 15,000 points. Whether you’re exploring a new city or returning year after year, let Drury Rewards help you experience all of it. Redeem your points for select nationally-known merchant gift certificates such as Amazon, Target, Home Depot, Best Buy and more. Retail gift cards start at 20,000 points. Don’t spend your whole weekend getaway driving to your destination. Turn your Drury Rewards points into airline miles to get you there faster. Airline miles start at 25,000 points. As a valued Drury Rewards member, we are excited to offer you the fastest way to earn Drury Rewards points! Apply for your Drury Rewards Credit Card today and enjoy 15,000 bonus points in your Drury Rewards account once you make $500 in Purchases on your new credit card. Earn 1x point per $1 spent everywhere else Visa is accepted! to manage your VISA® account. Subject to credit approval. You will qualify for the 15,000 Drury Rewards Bonus Points if you use your new credit card account within 90 days of account opening to make any combination of Purchase transactions totaling at least $500 excluding any transaction fees, returns and adjustments and excluding any type of Balance Transfer, Cash Advance, Cash Advance Transaction Fee or Cash Advance Interest Charges. By applying for the Drury Rewards credit card you are authorizing Commerce Bank to share information with Drury to fulfill the bonus points. Drury will be notified of your account opening, and when you qualify for the bonus points. Points required for free nights vary by hotel, room type and date selected. Drury is responsible for fulfillment. Please allow up to 30 business days to receive your bonus points. Offer subject to change without notice. Limit one (1) 15,000 Drury Rewards point bonus per membership account. Drury Rewards members earn 10 Points per $1 spent on eligible room rates and an additional 5 points per $1 when paying with your Drury Rewards Visa. Points earned and accrued are subject to the Terms and Conditions of the Drury Rewards program. Please refer to DruryRewards.com for complete Terms and Conditions of the Drury Rewards program, including all redemption values. Terms and Conditions of the Drury Rewards program may be modified and services and benefits may be added or deleted at any time without notice to the cardholder. Commerce Bank is not responsible for fulfillment of Drury Rewards member points, or failure to provide the stated benefits and services. Points awarded through the use of the authorized user’s credit card will only be credited to the primary cardholder’s account. Please allow 30 days for points to post to your Drury Rewards account. No additional points will be earned for complimentary nights, travel agent rates, employee rates, internet discount travel site rates (i.e. Expedia, Hotels.com, Travelocity, Orbitz, Priceline, etc.) and group tours and contract rates unless otherwise agreed to in writing by Drury. However, for these purchases you will earn one (1) point for each dollar in Net Merchandise Purchases anywhere Visa is accepted. It’s free, quick and easy! Just fill out this quick form, and you’re officially a Drury Rewards member! Or, sign up at the front desk during your next stay with us. How do I report a missing stay? If you don’t see some points from any stays since you've enrolled, please submit a Missing Points Request Form. As a member of Drury Rewards, you will earn 10 points per dollar spent on your room rate before taxes on qualifying stays. Are there times I will not earn points on my room? You will not be able to earn points for complimentary nights, travel agent rates, employee rates, internet discount travel site rates (i.e. Expedia, Hotels.com, Travelocity, Orbitz, Priceline, etc.) and group tours and contract rates unless otherwise agreed to in writing by Drury. I paid for several rooms on my last visit. Can I earn points on all of them? Points are earned on the room occupied by you (the member), plus two additional rooms if all eligible charges for all rooms are paid on your (the member’s) invoice. You must stay at the hotel to earn the points. Are there black out dates? No! You can earn Drury Rewards points 365 days a year. How do I book a room using my points? You can book a room using your points by logging into your online profile at the top of this page! Or, our team at 1-800-DRURYINN (378-7946) would be happy to help assist you. Can I use my points for someone else? You can redeem your points for someone else by calling 1-800-DRURYINN (378-7946) and asking our team to put someones else's name on the room when making your reservation or after you have made your reservation online. Please note, this request must be made by calling 1-800-DRURYINN. If you made your request online, please have your confirmation number available. Can I get a replacement membership card? 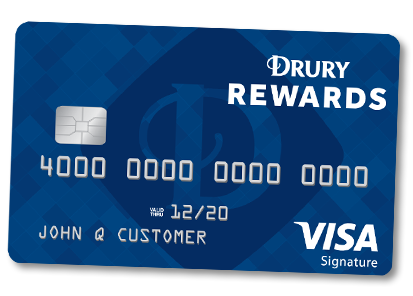 Drury Rewards is a name-based system, so no membership card is required. That’s one less card in your wallet! Just remember to sign in before booking online, or let us know you’re a Drury Rewards member when booking with our National Reservation Center at 1-800-DRURYINN (378-7946). If you have not had any activity within the past 18 months, your account will be deactivated. Please call our Membership Helpdesk at 1-800-325-0581 to request more information about reactivating your account. How far back am I able to view my account history? Your online account statement will show a detailed account history for the prior 18 months. Anything older than this is reflected in the starting balance. If you would like to check on a specific date, please contact our Membership Helpdesk at 1-800-325-0581. Where can I apply for the Drury Rewards Visa® card? Just visit the Drury Rewards Visa website and enter your information. It’s fast, easy and free to apply! Please read our Membership Guide for all program terms.